One of the more fascinating topics of discussion that is brought up annually by media members at a championship event is what players do on the night before a big game that could potentially impact their performance. All the special training and proper dieting leading up to that pivotal Game 1 of the Stanley Cup, World Series or NBA Finals (we’ll throw in the Super Bowl and Grey Cup, too) along with the proper rest can make all the difference come game time. At this point, most athletes are at the top of their respective games, meaning they’re deep into a detailed routine that can include sleep monitoring, and other crazy obessive tactics like weighing food portions. Some will even go the extra mile and refrain from going on social media and dedicating their time to watching TV; or excessively using a computer, tablet, or a smartphone. This may seem a little extreme, and it’s fair to point out that not all professional athletes are like this. In fact, sometimes the best way to prepare for a game is to remain loose and engage in a classic childhood video game that can put the mind at ease. 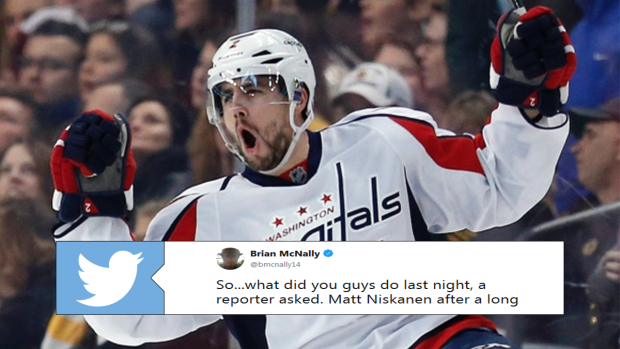 That’s what Capitals defenceman Matt Niskanen told media members when asked what he got up to on Sunday night in Sin City. About 4 hours of Mario Kart to be exact. While the tweet doesn’t say at what time they started or how long they played until, there a far worse activities Niskanen could’ve gotten up to in Vegas, but you probably would’ve never thought they would’ve played Mario Kart. The lastest edition of the staple was released on Nintendo Switch in April of 2017 (Mario Kart 8 Deluxe), and is the second highest selling game on the console. Or did Niskanen whip out the N64 and bring out the legendary version of Mario Kart? Brooks Orpik had other plans. If you thought the Capitals spent a crazy night in Vegas on eve of Game 1 of the SCF, well, think again. Matt Niskanen: "I played about 4 hours of Mario Kart." Tom Wilson: "I can be a witness to that. He did play that long." Brooks Orpik: "I watched the basketball game." Perhaps Niskanen will have a little extra jump in his step on Monday night.